After participating in the 1975 Portland Rose Festival, the ship's crew requested that its four-letter Navy call sign be changed to "NOLY", acknowledging the ship's nickname of "Oly" (in part inspired from the Olympia Beer that was popular on the West Coast at the time). It is possible that the ship's crew maintained a large inflatable Olympia Beer Can as a "mascot" that was displayed for special occasions, although no photograph of the "mascot" has been posted here. Oldendorf was eventually posted to Yokosuka, Japan as part of the United States Seventh Fleet. She was a member of the USS Midway battle group until being transferred to San Diego, California in 1991. During her time in the 7th Fleet she was involved with numerous events including regular exercises with all major navies in the area. 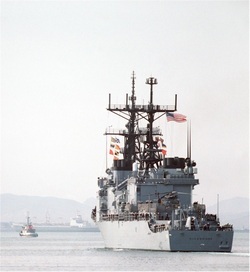 In November 1986, along with the USS Reeves (CG-24) and USS Rentz (FFG-46), she visited the port of Quingdao, PRC, the first group of US warships to visit Mainland China since 1949. She also was the first warship to be granted access to the small Australian village of Gove since 1975, when a seafaring naval tug was last to visit. The Oldendorf had received approval from the Aboriginal tribe leaders to make a port of call there as a sign of good will to the US Navy.